Here are some common drinks, and how to identify them. "An alcoholic beverage usually made from malted cereal grain (as barley), flavored with hops, and brewed by slow fermentation"
Most teens know what a beer is or how it looks. Generally yellow to brown in color, it normally has foam at the top and comes in a bottle or can. Ale: Higher in alcohol than lager, it is reddish brown to dark brown and is often warmer. 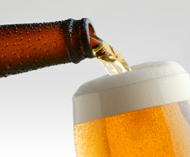 Lager: Generally less alcohol, is lighter in color, and colder than ale. Beer is also called brew, brewski, chill, cold coffee, hops, malt, stout, and suds. "The fermented juice of grapes, made in many varieties, for use as a beverage, in cooking, religious rits, etc., usually having an alcoholic content of 14% or less." Wine is another easily identified alcoholic drink. Characterized by a tall, slender bottle, wine is normally poured into a glass similar to a goblet with a foot and thin stem. Wine comes in many varieties including: red, white, sweet, dry, still, and sparkling. One of the most easily recognized wines is champagne. "Alcoholic drink that is distilled rather than fermented"
Includes brandy, whiskey, scotch, and vodka. "Drink made of one or more kinds of liquor combined with other ingredients, usually shaken or stirred before serving"
Each blend has its own specific name. Mixed drinks include martinis, which are charcterized by a triangular glass with a thin stem. They often have small umbrellas or fruit, and are sometimes rimmed with sugar crystals. Some slang terms for alcohol are: canned heat, hard stuff, moonshine, red-eye, tipple, toddy, rotgut, sauce, hooch, booze, scoops, juice, and firewater.